Thanks to Annette MacKenzie, Visitor Centre Manager at the distillery, we had the good fortune to try the Glenmorangie Cask Masters candidate expressions and vote for our favorite. Now we should note, this Cask Masters idea was put in place to let fans and consumers have a say in what the next Private Edition expression would be (the last one was the wondrously crafted Ealanta). The first candidate, Cask A, was a whisky extra matured in Grand Cru Burgundy casks. We liked the clear wine notes on this one, but all things considered (including how the other two tasted) found it winey-er than we would have liked. Cask B was extra matured in Grand Cru Bordeaux casks. We were starting to see a theme here, and began to wonder if other candidates might include a Petit Cru or even a Mini Cru (we were so hoping…). We found Cask B to be a more balanced whisky than A, and one that benefited in many ways from the extra time in Bordeaux casks. Still, our judgement was, again ceteris paribus, the Cru didn’t make us feel as Grand as we’d wanted. However, Cask C, a whisky extra matured in Manzanilla casks, fully…aggrandized our Cru, as it were. Ahem. At any rate, we loved the exotic mankiness on the nose and the orange notes on the tongue and the lingering, but rather subtle finish. Really, we loved the overall balance and flavor profile here: beautiful, complex, and singular. There’s a reason Dr. Bill Lumsden is a famous dude. With that setup, you can imagine it came as no surprise to us that our preference won the vote. Huzzah, Manzanilla fans and people of good taste everywhere! 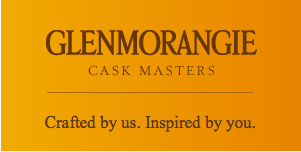 Well, now Glenmorangie’s onto the naming part of this game, and the options are three. There’s “Coileanta” (Mastery), “Salainn” (Sea Salt), and “Taghta” (Chosen). We were disappointed that they didn’t give us the option to vote for some other, lesser known Gaelic words that John, Bill, and I have grown to love over the years, like “Inglebourach” (hot mess), “Sonse-spleuchan” (happiness pouch), or “Coileanteach” (masterful old woman–oddly enough, Bill was really hoping for this one). But you know, like a lot of other things, there’s not much we can do when they never bother to ask us first. You have to sign up first to be able to vote and to be entered to win prizes. Go to the site, watch the videos, read the stories. Do all of this first so that you can make an educated decision. You know, because these are weighty matters.